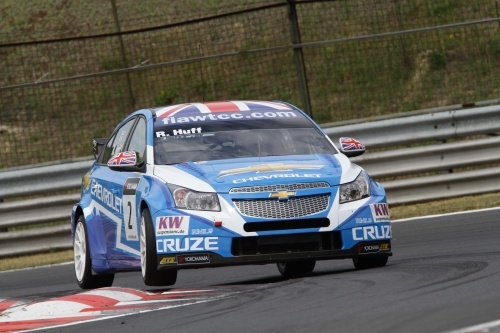 Newmarket’s Rob Huff overcame a qualifying setback to clinch a podium finish and stay on top of the FIA World Touring Car Championship (WTCC) at rounds seven and eight at Budapest, Hungaroring, on 5 June 2011. Rob’s weekend got off to a tough start when the Newmarket based 31-year-old narrowly missed out on making the second qualifying session after his lap time of 1:57.854 was just 0.148 seconds shy of a top-ten slot, leaving him 12th on the grid for both of the weekend’s races. Not to be deterred, the present WTCC championship leader produced an incredible drive in race one, climbing up through the 18-strong field to sixth position by the final lap. Rob’s excellent performance was perfectly capped when he overtook both 2009 Drivers’ Champion Gabriele Tarquini and 2010 Drivers’ Champion Yvan Muller on the last lap to finish fourth and claim 12 valuable championship points. In the weekend’s second race the WTCC’s sole Briton produced another world-class drive, getting himself up to fifth-position by the time the race was stopped due to torrential rain. At the restart, the Chevrolet works driver again attacked the drivers ahead of him, climbing three places to secure a second-place finish. Overall, Rob made up 18 places across the weekend’s two races. Rob’s excellent weekend means that his lead of the WTCC Drivers’ Championship stands at 31 points, while Chevrolet’s lead of the Manufacturers’ Championship has again increased. Rob next travels to Brno, Czech Republic, on 18-19 June 2011.